On Sunday 12th September the MacKinnon family hosted the Internationality Doubles at the RMTC. In what must be one of the club’s longest running and most popular events on the calendar, Richard, Andrew, Ken and Jan turned on a brilliant all-day event starting with breakfast. Richard Mac can rightly claim to cook the best garlic mushrooms in town and Andrew’s roasted tomatoes alongside Ken and Jan’s eggs and bacon made for a perfectly balanced breakfast that got everyone in the mood for the day ahead. For those of you who don’t know, one of the traditions for this event is that each team prepares a lunch dish from the country they are representing. For lunch we ate Moussaka, Lasagne, roast beef, salad, braised lamb and noodles, tarte tatin, tiramisu and more besides – there was plenty for everyone and yet still not enough! National costume is also encouraged and the day’s best costume winners were Lizzie Brown and Claire Heughan who played in pyjamas while representing the Land of Nod. 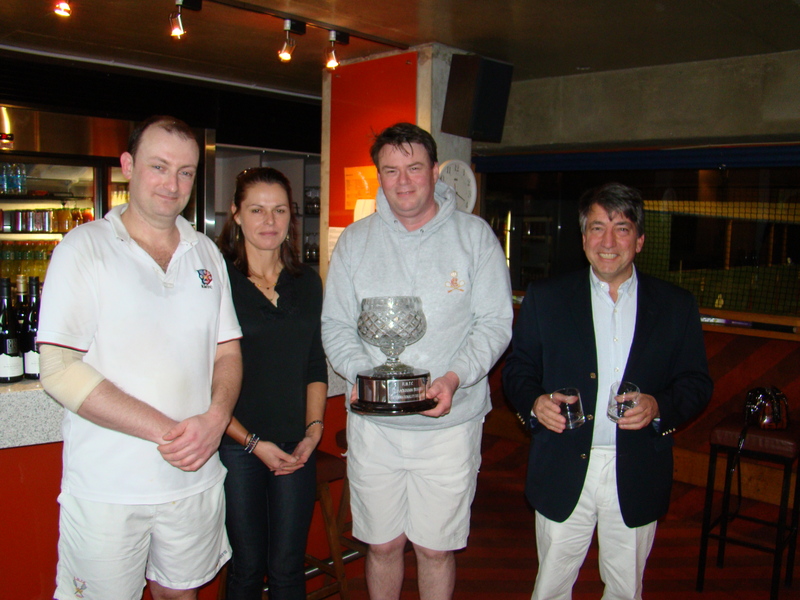 After a few drinks during the evening Claire smiled and said “I’ve just won my first tennis trophy … pity it wasn’t for playing tennis”. Amongst all the fun we also managed some tennis. Ten teams representing the likes of Nod, France, Iceland and Turkey battled for much of the day. Most of the matches were close and the semi finalists were not determined until the last matches. The reigning title holders for the last 2 years, Turkey (Richard MacKinnon and Euahna Varigos), were again in the thick of it as they defeated Anabelle Guest and Dianne Rennard of Italy 5/3 in one semi-final and Owen Guest and Andrew Gould, the well known Icelanders, were too strong for the Snoozers Lizzie and Claire in the other semi. The final was a close run affair with Turkey looking like taking the title for the 3rd year running when they took a 4/1 lead. However, the Icelanders, with bellies full, steadied their longboats before securing a 6/4 victory over the Turks. A big thank you to the MacKinnons whose generosity extended even further as they opened the bar for the players after the final and to Jonners for displaying his usual panache whilst running the tennis side of things.